I need some help with the 218 (static/permanent IP address). The problem is not only on my system, so it’s maybe never worked, but I don't know that. My system runs with the 218 stable, so I guess it is not a specific issue. Using the "IP control" app on my iPad and open info/settings menu (in the top left corner), the control table shows "audio menus". There are adjustments for treble, bass, balance, axis and phase. Can somebody tell me if that is the same on his equipment or could be a reason why it not work? The standard functions play, pause, stop skip, mute and volume working with the "IP control", so there is no "logic" for me why the others *** don't work. Or maybe it have never worked, maybe our lively dealers can tell more here? Sorry Robert. I don’t have a 218. However, reading your post a few times I am not sure exactly what your problem statements. Just had a little go as I listen to a tune. Treble and Bass work for me as does Balance. Tone controls are very subtle and I never normally adjust them. Min Treble and Max Bass made it clear they work. Thanks Chris and Nick for your help. Stream with the 218 and use the M app "IP Control" you see a virtuell remote control (MSR). Select then the "Audio Menu"
You get to the "tone controls"
The controls for "balance and "phase" are working both display and audio. Controls for "bass”, "treble" and "axis" only the display is working, NOT the audio. Communication except for that controls is flawless, the speakers are SL version, so? The core is on OS X and i have the latest sw version I guess. Chris which version, sw and hw do you have and do you have a PC as core? I just use the Left Right, up and down arrows. I agree, I don’t think they work from there unless maybe you press Store? Thanks, did not try that, as the others working without store, will do it. This caused me no end of trouble untill I worked it out. The 218 version number is 1.0.185 and Roon is version 1.5 build 333 on my iPad. Have you tried speaker typing? 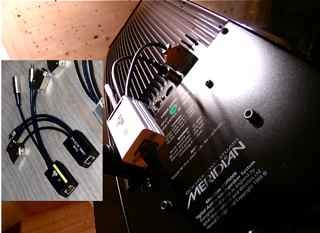 In the DSP manual under Changing the treble, bass, or phase it states "If you have a Meridian Surround Controller or Audio Core product these functions are performed via the surround controller.". I also have Roon Core version 1.5 build 363 on my the MacBook Pro. Strange, that it works at your side and not on my side. Thanks David, I have typed number 6 long ago, the other function are working flawless. My understanding is that the controller or core send the commands to the master DSP via the M-comms. And also the network device get that commands from the ID-control and "transmit" that command further down to the speaker. So I don't know, but will try once more maybe with 5?